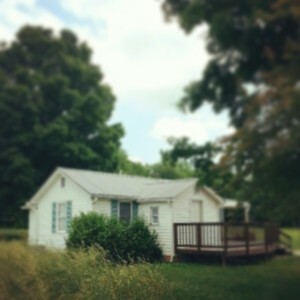 This Old House | All Things Ali J. Today we leave the house that’s been our home for the past 8 years. It’s the place we slowly grew into each other and became a family. We’ve had some of our worst fights here and some of the sweetest most wonderful moments. It’s the place I told my husband he was going to be a father, the house we brought our son home to and where we learned the real meaning of unconditional love. It was in that red chair in the corner of that teeny living room when my son smiled at me for the very first time. It’s on these floors that I’ve traveled miles and miles walking our baby to sleep and then watched him dream and grow. It’s behind these closed doors we’ve shed our most bitter tears and laughed so hard we thought we’d die. So while I’m so excited to open this new chapter of our life together this moment is very bittersweet. To anyone else it’s just a little insignificant white house on a little country road in a little town but it’s so much more to me. So even though I’ll walk out that front door for the last time today, all the memories and moments created within its walls are coming with me.